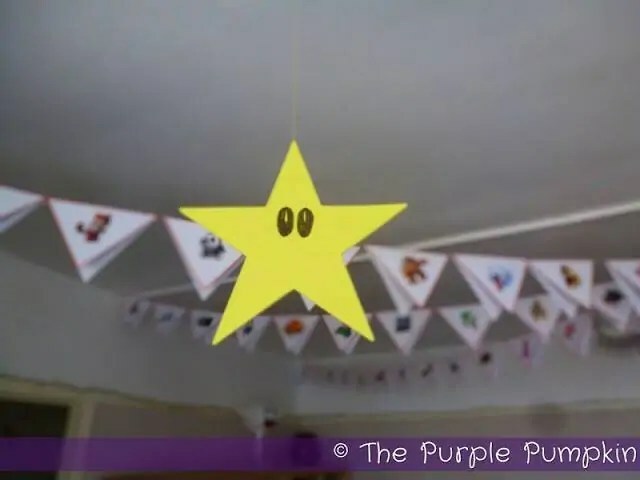 Another easy decoration that I made for my son’s Nintendo themed birthday party was some Starman Hangers. Starman makes Mario invincible, and are not to be confused with regular stars ^_^ I attached them to cotton and hung from the ceiling. You need some yellow stars…I found some foam stars in Hobbycraft, (on sale, left over from Christmas), but you could easily use yellow card and cut out star shapes. You also need a black marker pen. Drawn on some long, oval-ish eyes like so….